Shimedaiko is about 1kg, held by one hand, we hit it with big movements. 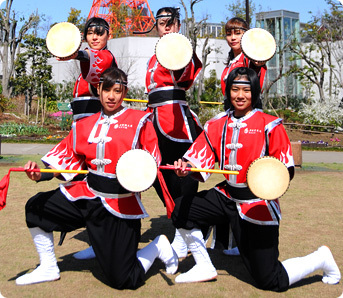 Shimedaiko is popular in Okinawa City and Kadena City where dynamic dances are preferred. The smallest drum used in eisa with one face, held by one hand. Its sound is very dry. The word Paranku means “a drum with paran sound” and its origin is Amida Buddha dance. Obata is the tallest object in eisa, representing a bridge between the heaven and the earth. This will be a landmark for the Sacred Spirits to descend to our world so that it is considered holy. The Obata, with a 4 meter long pole, a width of 2 meter (square), are used in most events in vivid red and blue colors. The Gurenbata also works as a landmark for the Gods to come down to the earth. It is 3 meter tall with two colors, red and yellow. Gurenbata are used in the parades or performances where people run around. 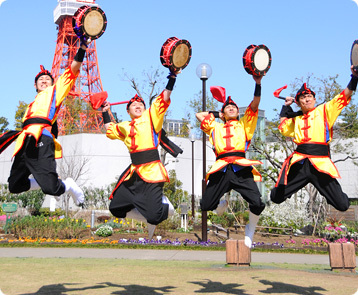 Noboribata is the symbol of Ryukyu Budan Shoryu Matsuri Daiko with the words “Shoryu Matsuri Daiko” on its surface Since it is very tall, Noboribata can only be used in open-air events. 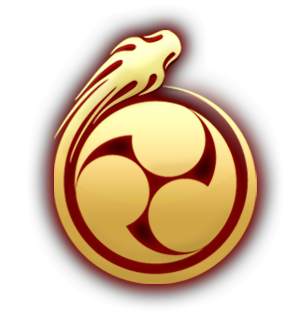 You will be able to find Noboribata in big events and events where many eisa groups participate. In eisa festival by youth associations, clowns called Chondarah make a line with Noboribata and rotate and wave those flags to send energy to dancers. 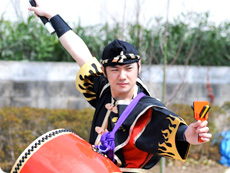 Ufushishi join the performance mainly during “Shishi Gong Gong” song or Kachashii. Two people inside Ufushishi operate it. It used to be made of fiber called Basho (Japanese banana) , but Manila hemp fiber is used now as Basho is very expensive today. Ryukyu Budan Shoryu Matsuri Daiko owns 8 large, 2 medium, and 2 small lions. This dragon is so large that Seven people operate it. Unfortunately, you can find Ryu in big festival halls only because of its size. This Dragon is made of several hundred scales, each of which is carefully made by hand. We made and own one Ryu as you can find in the picture. In many regions of Okinawa, people enjoy tug of war events. This event started over 600 years ago, during the Ryukyu Kingdom Era, for the extermination of harmful insects or exorcism when a plague was spreading. Today, these events are held for the pray for good harvests, morale uplift, or exorcism. Hatagashira is a must item for those tug of war events. Shape, decoration, and words differ depending on a region. 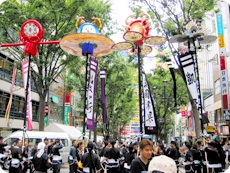 It is believed that God will descend on tall Hatagashira which will join the tug of war to bring in fortune. Hatagashira usually appear from east and west together with people participating in the tug of war, but we can find Hatagashira in other events for morale uplift or tradition preservation. We created for Hatagashira, “Ufumusun” “Gaika” “Bankoku Shinryo” “Onko Chishin” with utmost care by managing time in our busy schedule. “Ufumusun” and “Gaika” are replicas of ones actually used in Okinawa Ohtsunahiki (Okinawa big tug of war event). “Bankoku Shinryo” with dragon decoration and “Onko Chishin” with phoenix decoration are our original Hatagashira. Each Hatagashira is wonderful one with size, weight, and decoration equal to Hatagashira used in Okinawa. 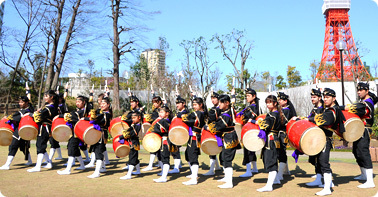 Naruko is originally used in Kochi’s Yosakoi dance and Hokkaido’s Yosakoi Soran dance. Appropriately used, Naruko provides additional attraction to dances and brings cheerful atmosphere. At Ryukyu budan Shoryu Matsuri Daiko, we use Naruko for our original song “Ryukyu Yosakoi Soran”.